Monks clad in fiery orange robes rushing through the bamboo thickets; stately sages with silvery beards meditating in opulent temples; the acrobatic leaps and flips of a well-choreographed fight; these are the scenes we’ve come to associate with Chinese Kung-Fu. As one of the oldest and most well-known martial arts styles in the world, it has inspired numerous novels, television shows, and movies, captivating the hearts and minds of people across the globe. 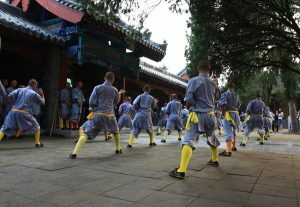 Yet few people know that, deep within the countryside of Henan province, the place where Kung-Fu originated still continues to practice this venerable art. The Shaolin Temple, also known as the Shaolin Monastery, is a 1,500-year-old temple complex located at the base of Shaoshi Peak on Mount Song in Dengfeng County. It is renowned as the birthplace of both the Chan (Zen) sect of Buddhism and Shaolin Kung-Fu. In other words, the monks quickly came to the conclusion that if you can’t solve your problem with peaceful meditation, it’s time to start using your fists instead! The temple’s profound historical significance meant it was designated a UNESCO World Heritage Site in 2010. 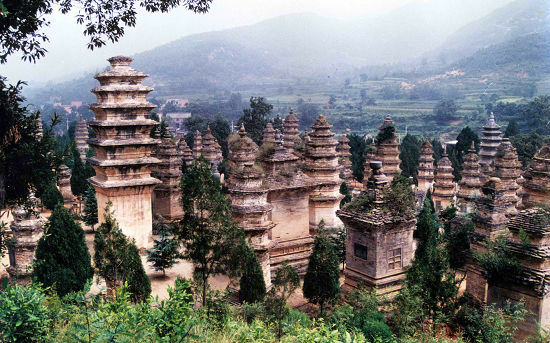 The name “Shaolin Temple” literally means “Temple within the forests of Mount Shaoshi”. Perhaps not the most creative of names, but at least no one would forget where to find it! Historically speaking, the temple was originally built under the patronage of Emperor Xiaowen of the Northern Wei Dynasty (386–535) in order to accommodate a Buddhist master named Buddhabhadra (Batuo), who had come from India to propagate Buddhist teachings in China. As the first abbot of the temple, he dedicated his life to translating Buddhist sutras into Chinese and preaching to his hundreds of followers. While Buddhadhadra took a much gentler approach, another Indian monk was about to change the lives of the temple’s residents in a much more radical way! This monk, known as Bodhidharma (Da Mo), arrived at the temple sometime around the year 480. According to legend, he had trained his body rigorously as part of his religious practices, and was horrified to find the monks at the Shaolin Temple were so physically weak. He criticised them for their inability to defend themselves and he was unsurprisingly told to leave. In an effort to prove his strength and dedication, he went to a nearby cave on Wuru Peak and meditated there for nine years. He allegedly spent so much time staring at the cave’s walls that his shadow became imprinted on the rock-face! While the cave is open to the public, the ‘Wall-Facing Stone’ has since been removed and is now housed within the temple complex. Impressed with his persistence and self-control, the other monks welcomed him back to the temple and he began training them in martial arts. From then onwards, he was honoured as the First Patriarch of Chan Buddhism. He was also responsible for teaching the Second Patriarch of Chan Buddhism, Dazu Huike, after Huike reputedly cut off his left arm to prove his devotion to the study of Buddhism. You could almost say Bodhidharma was forced to give Huike a helping hand! There are now two areas of the temple complex, known as the First Patriarch Temple and the Second Patriarch Temple, dedicated to Bodhidharma and Huike respectively. Eventually the martial arts training that Bodhidharma bestowed on his followers would prove to be greatly advantageous. At the beginning of the 7th century, a small army of some 13 Shaolin monks were rumoured to have rescued the future Tang Dynasty (618-907) Emperor Li Shimin. In exchange, he showered the temple with land and wealth once he assumed power, allowing it to thrive as a centre for Kung-Fu. The complex reached its peak during the Ming Dynasty (1368-1644), when it was said to have housed over 3,000 monks! Tragically this high point was soon met by decline on the collapse of the Ming Dynasty, when the rebel leader Li Zicheng ransacked the temple and forced many of the resident monks to abandon their posts. Popular media often tells the story of the five fugitive monks, who escaped from the temple when it was destroyed during the Qing Dynasty (1644-1912) and spread Shaolin Kung-Fu across the world. While this story is largely regarded as fictional, the temple was often destroyed in such fashion throughout its history and monks did frequently leave to start martial arts schools elsewhere. Consequently, many of the buildings had to be reconstructed numerous times, meaning that the structures you see today are a result of successive renovation. The temple complex itself is made up of seven main halls along its axis and seven other halls arranged around them. 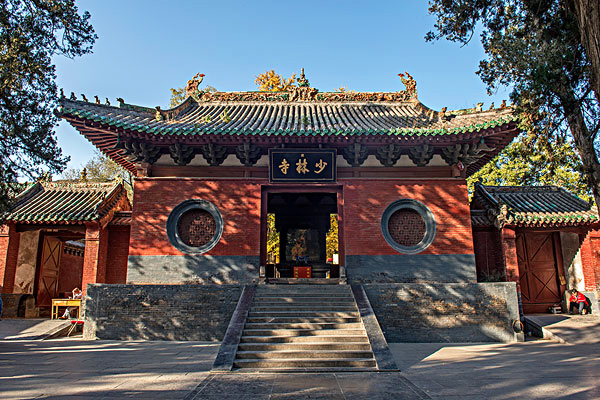 The first hall, known as Shanmen or “Mountain Gate” Hall, is marked by a large black tablet, which bears the inscription “Shaolin Temple” written in gold by the Kangxi Emperor of the Qing Dynasty. At the centre of the complex, you’ll find the Mahavira Hall, which is where all daily prayers and important celebrations are held. Its floor is embedded with 50 small pits, which are supposedly the footprints left by monks as they practised Kung-Fu. Talk about leaving your mark! As magnificent as these halls undeniably are, the highlight of the temple complex is undoubtedly the Pagoda Forest. This spectacular collection of over 240 towers, all of different shapes and sizes, sprawls across the mountain. Some are tall, some are short, some are cylindrical, others hexagonal. Since they all date back to a myriad of different time periods, from the Tang Dynasty right through to the Qing Dynasty, they represent a visual feast of diverse architectural styles. That being said, the term “Pagoda Forest” may seem somewhat misleading, since it is not a forest and they are not pagodas! 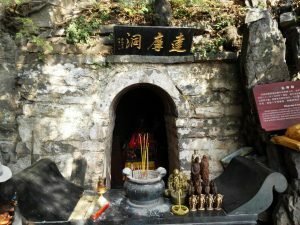 They are actually tombs or monuments erected to commemorate the death of an abbot or famous monk from the Shaolin Temple. A few notable pagodas were even dedicated to foreign monks, who made the harrowing journey simply to train at the temple. They serve as a testament to the Shaolin Temple’s undeniable allure throughout the ages.